Winterizing your boat is not only important for protecting your boat over the long, harsh New England winter, but also for setting yourself up for an easy launch next spring. It is an important process, and if you are doing it yourself, below are 10 tips you should follow to properly winterize your boat. To get the job done right, check out our Marine Store for all the products you will need. Our Marine Store is one of the largest, fully-stocked parts departments in southern New England. Use a quality fuel stabilizer to store fuel over the winter. After it is stabilized, run the engine so that the treated fuel gets through the entire fuel system. Most outboards are self-draining. Trim the engine down and it’s all set. Inboards have drain points around the engine. Look for petcocks or drain plugs that can be removed to let the water out of the block. Failure to properly drain an engine down could lead to a cracked block or other costly damage. After draining your engine, flush the engine then fill it with antifreeze. 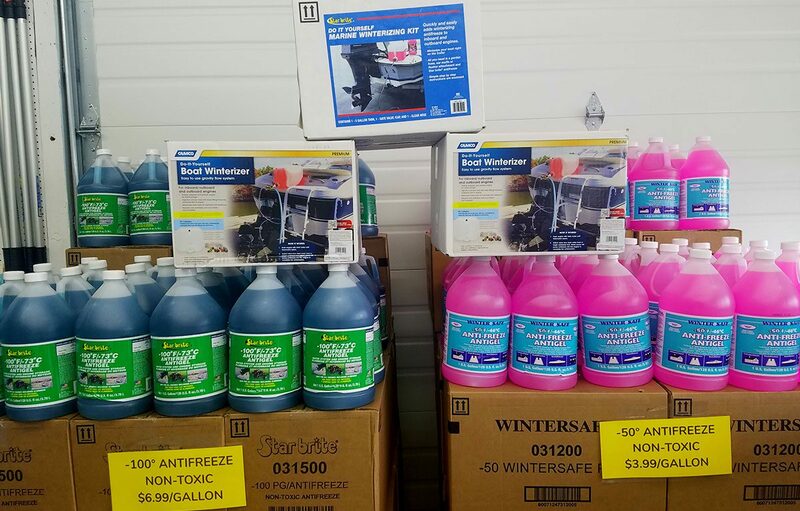 We sell a nontoxic antifreeze in -50 F and -100 F. We recommend -100 F for all engines. Flushing the engine with antifreeze requires an intake hose to be run to the water pump, while the other end is in a bucket, or reservoir of antifreeze. Make sure the connections are secure and run the engine until it discharges the antifreeze with the exhaust. We sell a do-it-yourself kit that makes it easy. The kit includes a container with hose fittings installed, the hoses, and the muffs. After a season of use, the oil should be changed. Warm up the engine to allow the oil to drain faster. Changing the oil helps prevent moisture build up in an engine. Drain the gear oil. Check the quality of the oil. The condition of the gear oil can tell you a lot about the condition of the gear case. Milky oil is water, metal fragments could be excessive wear or other damage, and black oil is burned gear oil. Amber gear oil is ideal. After the season, a sterndrive usually fouls with marine growth. Remove all growth and barnacles, and be sure to check in any water passages. Barnacles like to grow everywhere. Check all the bellows or rubber boots for cracks or damage. Lubricate all grease points. Fogging an engine puts a coating on the inside of the cylinders that prevents corrosion throughout the winter. This is done by spraying a can of fogging oil or running a winter mix into the fuel system until the engine stalls. Also, there are EFI fogging oils that ix with gas and are designed to be run through the engine. When this is complete, it is important to drain the entire fuel system. All water systems need to be drained, whether they are fresh or salt water. Drain all wash down pumps, heads, showers, baitwells, faucets, heads, air conditioners and hot water tanks. We recommend that -50 F antifreeze be run through all water systems, once they are drained, to prevent any lines from cracking or fittings from breaking. The fluid level on all batteries should be checked and they should be load tested. All batteries should be given a full charge for the winter. Then the negative cable should be disconnected. Cabins and interior spaces can collect and hold moisture, which can lead to mildew and mold. Cleaning the water out of the bilges will help prevent mildew and mold. Moisture bags and damp away products will also help to pull moisture out of the air.